My teammate Jean-Luc David is now in Paris with the Canadian finalists: Team RoboTree (short film) and Team GreenNet (Interface Design). Check out how our Canadian teams are doing on CanDev blog and JL's personal Flickr site. Let's send the best wishes to them from home! The team is well on it's way to create a new short film for the competition. The students were thrown a curveball as the theme and the guidelines for the finals are the same for the second round. Essentially, the goal is to "share a perspective on how technology enables a sustainable environment". The team worked into the wee hours of the morning, took a break and then kick started this morning. Media, Drake and Ryan have been travelling all over the city by rented bicycle and using the Métro. The deadline for the film is 2:00 AM tomorrow morning, then a presentation at the Digital Theatre on Monday. 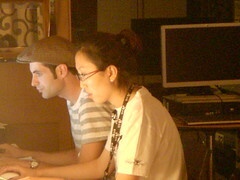 Jin and Kevin are furiously working on their interface. As I type this, it's the final hour of the competition for them - then well deserved sleep as they have been awake working for the past 24hrs. The goal for the finals is to innovate and envision revolutionary interfaces for a mobile devices, a Web application and Web portal based on the theme "Imagine a world where technology enables a sustainable environment". After today, the team gets to relax a bit and wait for the judging results. You can view more photos here. Best of luck to both Robotree and GreeNet. Go Canada!"